A keen awareness of the level of Varroa mites in the hive is a primary concern for most beekeepers. There are numerous ways to measure the mite load, with methods like the sugar and ether rolls being popular. The question of how and when to treat for Varroa, though, is one that has consumed many an hour at beekeeping clubs, as well as many pages online! In recent years one of the more popular treatments, favored by many beekeepers, is the application of oxalic acid. In this article we take a detailed look at oxalic acid, how it works, why many beekeepers consider it an essential part of their arsenal against the threat of Varroa and some cautionary notes on its use. 2 What is oxalic acid? 3 Why is oxalic acid of interest to beekeepers? Much of the debate around the use of treatments by beekeepers focuses on the use of harsh chemicals in the hive. Indeed, some commonly used treatments are based on unnatural chemicals and any beekeeper following natural beekeeping principles will likely have an aversion against such treatments. Oxalic acid, however, is entirely natural. It is an organic compound found in nature within many plants, including vegetables, leafy greens, fruits, nuts, seeds and more. Herbivores find oxalic acid repellent, which is a handy property if you are a plant! Chemically, the oxalic acid molecule is comprised of two carbon, two hydrogen and four oxygen atoms. It is a colorless solid that dissolves to form a colorless solution in water. It has many practical uses beyond beekeeping, including as a cleaning or bleaching agent and is often used to clean minerals. Why is oxalic acid of interest to beekeepers? So, with that, why is oxalic acid of such interest to us? It has been shown to be a direct and effective treatment for Varroa mites and has been used for this purpose in Europe and Canada for many years. It was only approved for use in beehives in the US in 2015. Oxalic acid isn’t terribly expensive, is natural and can be very effective. What’s not to like? Truth be told, it’s not entirely understood why oxalic acid is so effective in treating Varroa. But the most popular theory is that it enters the mite through its feet (yes, really!) and then moves into the bloodstream. From that point the mite is a goner! Meanwhile, bees don’t have a particularly adverse reaction to the correct application of oxalic acid. When we choose oxalic acid as a treatment, we’re leveraging that handy little fact, for the benefit of our bees. We should qualify the statement above somewhat. Any treatment applied indiscriminately can harm your bees and this is certainly true with oxalic acid. 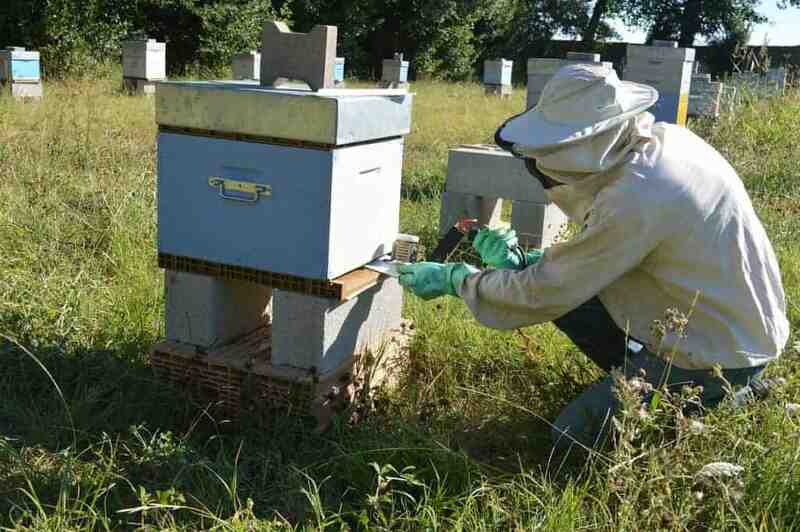 The approved use of oxalic acid in the hive – using the documented procedures and cautions – will be just fine. But don’t deviate from that, since overuse can indeed be harmful to your bees. Let’s start with the easy-to-explain bit – you need to be careful around oxalic acid. It is irritating to the eyes, mouth and skin. It also has a bitter taste (we don’t suggest you test that!). Indeed, it is labeled with the highest degree of toxicity, “Category 1”. Click here to see the EPA label for the use of oxalic acid for beekeeping (scroll down to see the label). In short, protect your eyes and your hands, at least. Many beekeepers use oxalic acid, so with the appropriate procedures and caution, such as the use of a respirator, it’s perfectly simple to use safely. Another an important note! Remove honey supers before applying oxalic acid and allow at least 14 days before putting them back, so that acid is cleansed from the hive, thus avoiding honey contamination. Like all mite treatments, there is a risk associated with the potential overuse of oxalic acid. The ever-changing battleground taking place in the hive between bees and Varroa is an evolving landscape. One key component is the ability for Varroa to build a resistance to any particular treatment. This has been seen over the years many times as well-established treatments decline in their effectiveness. Oxalic acid remains a popular and largely effective treatment, when used intelligently and only as needed. But as its use grows, Varroa will adapt. If overused, there is every chance oxalic acid will become less favorable as a treatment. For this reason, use oxalic acid with forethought and a clear strategy. One common strategy for many beekeepers is to vary their use of mite treatments over time. For example, by changing the type of treatments used each year Varroa are less likely to develop a resistance. A large percentage of Varroa in the mid-summer hive do their damage under the protective cover of the capping on a cell. As well as sucking the life out of the larvae resident in the same cell, the female Varroa that entered the cell initially will reproduce. Eventually, a single cell will be home to many Varroa. Oxalic acid is not effective against Varroa in capped brood. This, of course, has important implications for how and when it can be used. During the summer only about 15 – 20% of Varroa are in the phoretic state, meaning they are roaming the hive or attached to bees. The remainder are in a capped cell – out of the reach of oxalic acid. Therefore, the summer is often considered a less-than-optimal time to apply oxalic acid, since only a small percentage of the Varroa in the hive are “reachable”. But that doesn’t mean it cannot still be an effective treatment, as we will see below. Treating Varroa is basically a numbers game, which should inform your use of oxalic acid. At a high level, there are two approaches to how it is applied. But first, let’s take a quick refresher on the time from egg to emergence from the cell. Then we’ll consider how this relates to the application of oxalic acid. From the day the queen starts laying eggs there’s an important clock that starts ticking (all beekeepers should be familiar with this, since it is important in many aspects of beekeeping). Days 1 – 3 : During these initial days we have an egg in a cell, in an uncapped state. Days 4 – 9 : Then the egg transforms to larva, a state that is maintained for six days. During this period the cell remains uncapped. Days 10 – 21 : Finally, the larva transforms into a pupa. The cell is capped at the start of this period. As a simple memory trick, start with three days (the time during which we have the egg) and then double twice – 6 then 12 days – for each subsequent stage. That gives us roughly 21 days, though see above for our qualifier on this timeline. During steps 1 and 2 any Varroa in the cell would be easy targets for oxalic acid. The cell is uncapped, so Varroa there would be fully vulnerable – if they were in the cell. In fact, Varroa are a little more clever than that! They don’t even enter the cell until just before the cell is capped. Therefore, for the first nine days (3 + 6), there are no Varroa in the cell. We’re good with those cells! But when the Varroa creeps into the cell just before it is capped…then we have a problem. We have a female Varroa and her offspring-to-come safely cocooned in the cell and protected from oxalic acid. One approach to this is to apply oxalic acid at a time when there are very few Varroa under capped brood. Or, more accurately, when there is very little capped brood. For this reason, oxalic acid is often applied in late fall or over the winter. Varroa present in the hive at this time are a metaphorical sitting duck for the treatment and we’ve a good chance of a highly effective application. Estimates vary but most beekeepers would expect an effectiveness of 90% or more in wiping out exposed Varroa. Oxalic acid can also be applied when capped brood is present. But now it becomes a tad more complicated and we’re back to our numbers game. Let’s consider a hive with a mid-summer mite count we don’t like and we want to do something about that. We can consider the mites to be divided into two buckets – about 15% – 20% in the phoretic stage and the rest under cover of a capped cell. Let’s start the clock by applying oxalic acid (we’ll cover how to apply further down in this article). The good news is that we just zapped 15% – 20% of the mites in the hive, with a degree of efficiency likely to be 90% or more. Those were our “phoretic sitting ducks”. The bad news is that on “day 1” the majority of Varroa are in capped cells. But we want to get those too. So, we have to get to them when they exit the cell. Remember, each cell-embedded Varroa has 12 days of protection above their heads after they entered the cell. We could just apply oxalic acid on days 2, 3 and so on, killing the Varroa exiting their cells on each subsequent day. That would absolutely have a really good impact on the Varroa load. But as you have probably guessed, there’s a huge, showstopper issue, namely we’re going to massively over-treat and threaten the health of our bees. Don’t apply oxalic anywhere near that often! A common approach is to treat again 6 days later and then again another 6 days after that. Some beekeepers prefer a 5 day period but we’re getting a little subjective at that point (another beekeeper debate topic right there!). Of course, there’s a “Varroa leak”, of sorts, here. We applied our treatment on day 1 and then wait till day 7. That still leaves the problem of Varroa exiting their capped cells on days 2, 3, 4 and so on. This means 5 days of Varroa leaving their cells and likely to find another cell about to be capped. The Varroa with fortunate timing can hide across multiple applications of oxalic acid. But, despite this, a multi-stage application of oxalic acid can still be an effective approach, even when capped brood exists. It’s not a perfect way to zap Varroa but applying oxalic acid in this manner can have a seriously positive effect on getting the mite load under control. So, you’ve decided to treat with oxalic acid. How do you do this? There are a few different ways in which oxalic acid can be applied. Two popular options are the dribble and vaporization methods. Let’s take a look at these two options. The dribble approach involves the use of a syringe to squirt the oxalic acid mixture on bees between the frames. The contact with the mixture doesn’t harm the bees, though they will likely consume small amounts, which can cause mild harm. But, given the dose, this is quite acceptable. Therefore, the dribble approach is best used for a single treatment, rather than repeated applications. In that context it is a good approach when used during a break in brood, which happens to also be when the application of oxalic acid is most effective. The dribble approach is also generally considered more suitable for a smaller number of boxes or hives, since it involves a little more work than other approaches. An Oxalic Acid Kit is available in the PerfectBee Store for use with this method. Although there may be small variations in the method of application, here is a video of the dribble method. The vaporization method is also very popular as a way to apply oxalic acid, with several advantages. When heated to around 100 degrees C , oxalic acid burns off water, leaving anhydrous (water-free) crystals. When further heated to around 157 degrees C, sublimation starts, which is the transformation from the solid state to a gas. Oxalic acid vaporization equipment takes care of the heating process, effectively fumigating the hive. One key advantage, as compared to dribbling, is that the treatment can be applied without opening the hive. This can be particularly important when applied in late fall or in the winter, when low temperatures may not be conducive to opening up the hive. Aside from avoiding disturbing your bees, vaporization is considerably quicker than the dribble approach. Some research suggest that vaporization is less detrimental to bees and brood, as compared again to dribble, which is a more direct application of the mixture directly on the bees. On the other hand, the presence of fumes means that the beekeeper does need to be even more careful to ensure the fumes are not inhaled. It is important to use a respirator for this reason. For a small number of hives, the Vorrax Oxalic Acid Vaporizer is effective. For a quick and highly-efficient application, the Pro Vap Oxalic Acid Vaporizer is a popular product.